1. 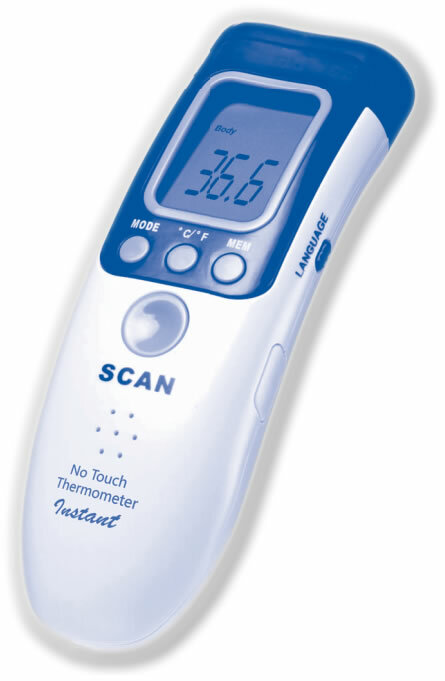 The No Touch Thermometer® Instant is specially designed to take the body temperature of humans. 2. The No Touch Thermometer® Instant provides quick and reliable results thanks to its unique, infrared detection system. 3. An alarm will sound if temperature registers above the “normal” range and the screen colour will change to Red indicating “High Temperature” or “Fever Alert”. 4. The unit’s memory can hold the last 32 temperature readings. 5. The unit’s backlit LCD digital screen makes the results easy to read. 6. Temperature can be displayed in either Celsius and Fahrenheit. 7. The unit’s automatic-off feature saves battery life. 8. The unit is small, convenient, and easy to use. – Follow the maintenance advice stipulated in this instruction manual. – For professional or personal use. – Must only be used for the purposes described in this instruction manual. – Optimal performance occurs when room temperature is between 10˚C-40˚C (50°F-104°F), do not expose to extreme temperature conditions. – Keep in a clean, dry area. – Do not expose this device to electric shocks. – Functionality decreases when relative humidity is higher than 95%. – The protective glass over the lens is fragile; handle with care. – Do not touch the glass of the infrared lens with bare fingers. – Clean the glass with a cotton swab, moistened with alcohol and rubbing lightly. – Do not expose thermometer to sunlight or to water. – Take care not to drop the device. – Should a problem occur with your device, please contact the supplier; do not attempt to repair this device yourself. It is essential to use the No Touch Thermometer® Instant as noted in this instruction manual. You are therefore advised to read this instruction manual and the safety precautions carefully before use. The No Touch Thermometer® Instant is pre-calibrated, so it is not necessary to calibrate the device when starting it up. However, in order to obtain reliable results, please allow the thermometer to acclimatise to ambient (room) temperature for 15 to 20 minutes before use each time there is a significant change in room temperature. For maximum accuracy it is also important to allow a one-minute interval between measurements.